Earlier this year, Rebecca’s husband Nick was hit by a car and seriously injured. Here, in one of a series of columns, she writes about the aftermath of his accident. 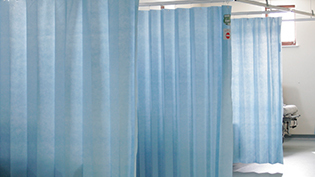 Privacy is an elastic thing in hospital. There’s no need for a loved one to suffer life-changing injuries in order for anyone to find this out, although it’s given me ample opportunity to think about it. Visit a decent-size hospital for a blood test or an X-ray and there’s likely to be at least a couple of people in flimsy surgical gowns and slippers puffing on cigarettes next to a no-smoking sign, their ankles starkly pale in the autumn sunshine. In the corridors, patients wield their drips like wheeled sceptres but look impossibly vulnerable. Breathe in! Bed-bound unconscious person coming through (with the help of an orderly at the headboard). Or perhaps they’re not unconscious, perhaps they’re squeezing their eyes shut so that they don’t have to see all the blood-test tourists peering at them as they make their progress to theatre.